Hi my name is Laird Herbert and I thought you might be interested in the tiny house I just completed. This is my second tiny home that I have built. I lived in one full-time for a year over the winter and sold it last spring. I’m 28 years old and have lived in the Yukon for the past five. I am pretty happy puttering away building things. I’d much rather do this then sit in a cubicle! My passion is actually the design, that’s what I enjoy the most. So I’m diving into it full-time (hopefully) and will be building two more this summer (one for myself and another to sell), under Leaf House, which is my new company named after the famed Leaf House on Hornby Island which is where I spent my summers as a kid. Anyway, I hope you enjoy this northern rendition of a tiny house! It is much more challenging build tiny houses in an extreme winter climate. I’ve learned quite a bit about what you need to do when it’s -40 outside and your space is 160 ft2. I’ve also learned that it is a lot more expensive to build things in the North! 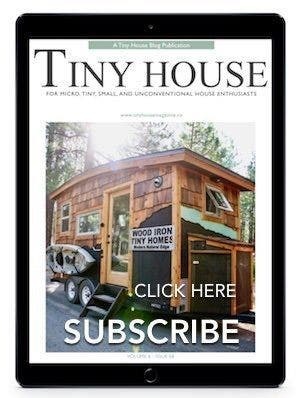 By far, my favorite tiny house ever posted here, I absolutely love it!!!…..1st!!!! Ditto! By far the most beautiful truly tiny house on this site, and one of the few to honestly grapple with cold weather climates (say what they like, most of the houses here simply aren’t properly designed for a Canadian or een a northern US winter). So beautiful! Please keep designing, so that when I’m ready to buy a tiny house, I can buy one of yours!!! Ditto! My favorite tiny house ever! This wonderfully designed. I’ve also been working on the design of a modern wedge shaped tiny house. I’d be interested in seeing more pictures of the half level used to gain access to the loft. I agree with Bob and all…It’s so nice o see modern! I want to see the bathroom and I am sill not getting where the stairs are for loft??!! Laird, could you help me out on that? Wow. 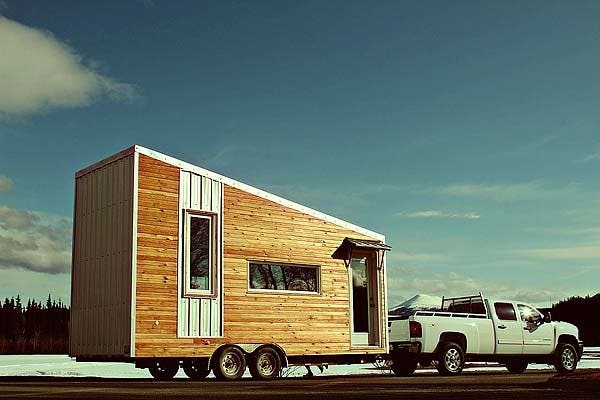 This is a fresh look at how to design space within the tiny trailer envelope. Very nicely done! My all time favorite! Sleek, modern, beautiful and luxurious all in one! Definitively the best! Congratulations and good luck with your business venture, should be a success! OMG I love this. Wonderful configuration and beautiful colors/materials. The other commenters took the words right out of my mouth, this is a fave! Show us more! Absolutely beautiful but I wonder why he didn’t maximize ceiling height in the front of the house. Excellent craftsmanship. Well done!! I would like to hear Laird’s explanation as well, but my guess is that the wedge shape a) makes the design more aerodynamic for travel and b) prevents heat loss. While a high ceiling in the entryway might be aesthetically pleasing, heat would settle in that unoccupied area, rather than in the sleeping area, where Laird’s design forces it. Ingenious! The slant will certainly help keep the snow off the roof. All this, and a good photographer as well. Some people are just too talented for one body! lower ceiling at front makes for less air-drag when towing. great idea. beautiful interior – love that you actually have STEPS to the bed, not a ladder (major downfall of most tiny house designers). congrats and best wishes for your new company, laird. I agree. I have a min pin and with just a slight modification to this design he could hop into and out of the loft area by himself. It’s a beautiful house! 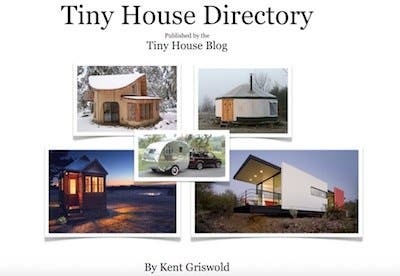 Nice to see a tiny house builder who recognizes that there is more to modern design than just slapping metal siding on a shed-roofed structure. Gorgeous! It reminds me of a tiny, sleek New York City loft. I really love how there are three different levels…a very interesting and novel (at least for me) idea. The stairs are a nice feature and it looks like there is a TON of storage. The only thing I wasn’t super crazy about is the railing for the stairs leading downstairs to the dining area. But, that’s a very minor detail. Overall, a brilliant job! I didn’t see any photos of the bathroom. Did I miss it? Nice looking house though its another example of beyond whats affordable to people trying to escape a mortgage at 52 thousand. beautiful! how much does it weigh? Could we see drawings of the lay out? its hard to get where every thing is. How is this particular house heated? I think the design is awesome…great job. PLEASE do not waste your talents sitting in a cubicle! There is so much more to life! Laird, when are you going to start selling plans or kits for this house? I think we all want one. Being a Canadian , I can appreciate the effort that went into this project to keep it comfortable for all seasons. Well done! Is one still for sale? I think Laird just solved the NWT and Yukon’s housing crisis. Can someone start a business making these, and shipping them by barge up the river to small communities? 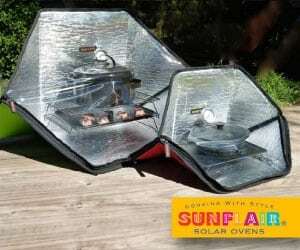 Sure wish I’d had one of these back in the wall tent days. Also beats the classic Yukon camper/trailer with a feeble shack falling off the side. Plenty of open space and enough light to keep you sane in winter. Love the stairs too. The only cabin fever here is feverishly wishing I had one! Amazing design. I love that it doesn’t have that “old timey” feel. It feels modern and I love the multiple levels and use of space. The steps is nice instead of a ladder. I would just get rid of the railing myself. Please sell plans! A lot of us in warmer climates could probably build it cheaper not needing so much insulation. Wow… I am from Russia and this post totally made my day. Would love to be able to buy plans! Elegant! Seconding the requests for Laird to sell plans. I have been playing with designs for the desert southwest climate, also an extreme. Curious to know the r-value on insulation. Also, why no windows in the rear? Structural or energy decision? This house makes me foam at the mouth in a good way. I usually don’t comment, but I really like this house. Please continue to spread your great ideas. Very cool design. Reminds me of this stationary small cabin -http://www.feeldesain.com/nido-micro-cabin.html. Oh yeah, the other bonus about this, no need to worry about your place freezing up when you go to town, just take it with you! This is awesome design and perfectly suited to a colder Canadian climate. Gorgeous! Love the staircase; my ONLY complaint or change I would want is a bigger kitchen sink in trade for fewer burners; it’s hard to wash big pots in those pretty little sinks. Great design, Laird! It’s SO nice to see one built for a cold climate. I live in northern MN where temps around -30F usually happen every winter (used to get down to -40F occasionally, but I think those days might be over). A lot of tiny houses are designed for mild climates like the Pacific Northwest, and they would not work here at all. 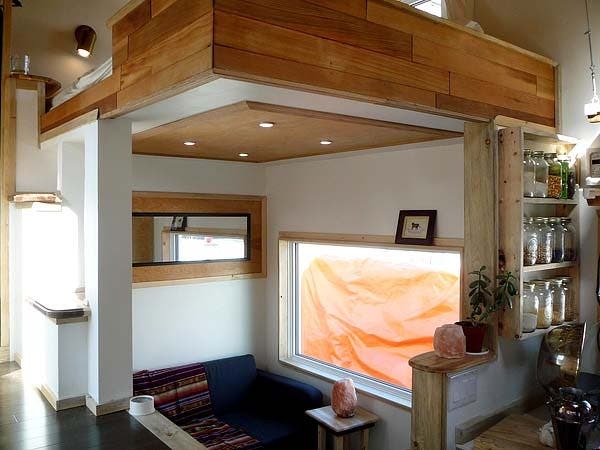 What a beautiful design and execution in a tiny home! This is a truly unique design. I love it! The split level separates the rooms while still giving an open large feeling inside!! Did you mention how it’s heated? Great to see original design thought. Beautiful house, the different levels make it more interesting. I agree. Start ferrying these up to SE Alaska. It’s amazing to see so many builds that aren’t geared for the climate…this is nice. I bought and live in Laird’s first tiny house. Quite different from V.2 but it too is a work of shelter art with beautiful custom details and a light, spacious feel. Photos coming soon. I’m thrilled to see this young man’s talents recognized on this blog! Maxine, I for one am looking forward to seeing photos of your tiny house built by Laird. He is very talented and artistic! Laird, you have real talent in design and construction! There is so much about this unique tiny house that’s right: steeply sloping roof to decrease snow load and increase ceiling height; super-insulation; multiple levels to create ‘rooms’ to facilitate the comfortable sharing of a tiny space; modern design with so many fabulous details (I really like the ‘framed’ or ‘boxed-in’ look around windows); a full bathroom; a real stove and oven; clever storage…and on and on. Being from a northern climate the only thing I struggle with in any tiny house is a lack of a mudroom. Coming in from outdoors with snowy/wet boots, heavy coat, mitts, hat, etc, there really needs to be a separate, tiled space with hooks, boot tray, and so on to contain the mess. I just don’t know how that could be incorporated though. Excellent work! All the best for a successful business. I have been inside Laird’s tiny house and it is amazing! Pictures cannot do it justice and the feeling of space is awesome. Lots of natural light and a flare for decor. I am a father with a family of four and we will be building our first tiny house here in Yukon starting now! Just took the first load of insulation to the build site. Our tiny house will be on a 24ft trailer with two lofts… We have fulled time before for two years in a 29ft fifth wheel. Going to be exciting! I love this tiny home! great design! I hope you sell many of them and that your designs continue to evolve. I love this home, I hope you build more, sell plans and continue to be creative. I’ve been looking for a house plan that fits me, and this is pretty darn close. Brilliant – Has some great lines! Laird, you got to sell plans for your version 2. I see a lot of requests for plans. Count me in ! let us know what your intentions are because I want to build version 2 and use it as my residence when I retire. Your design has some similarities to the 12cubed home design out of Vancouver. They used the vertical space to their advantage also. Let us know when plans become available. Impressive! Very clean, contemporary aesthetic that is still warm-looking and livable. Bookshelves too! I love this great house. Do you have any plans for this design? Where can we see more pics or updates? I’m in love with this and would like to know how I can comission you to build one for us just like it. We would love to see more photos or gather more information. We would like to start building a home like this in 2013, so any information you can give us would be helpful since the link to your website appears to not be working. You’ve done amazing work on this, and we can imagine ourselves in one! Thanks for sharing your amazing talents! 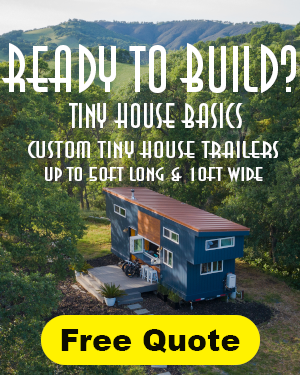 I am considering a tiny house on wheels using steel studs. Have you published any information about your experience building with them? 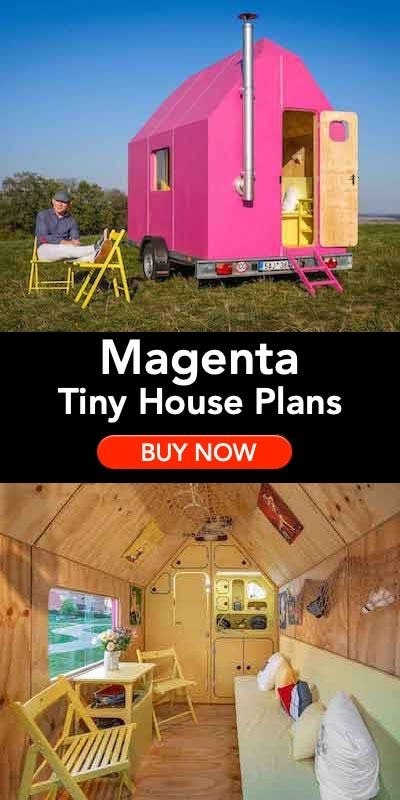 I’m curious about the weight of this tiny house. Did you rivet or weld the steels studs? Is the frame racking at all after traveling many miles? 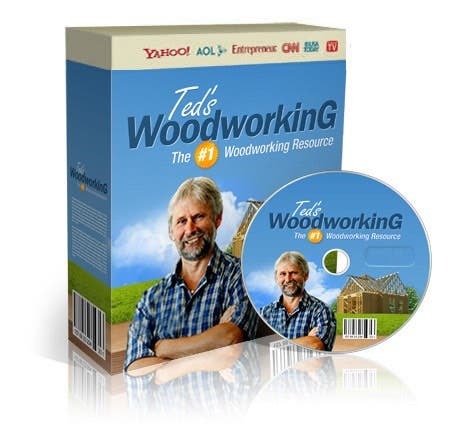 Hey Laird – what an awesome design, very inspiring! It’s hard to tell from the pictures, but is the living room floor lower then the kitchen/rest of the floor of the tiny house? I’m in upstate NY; betwn Albany, NY and Saratoga NY…..when/if your ever ready….say mid 2014…let’s talk about building me a similar unit..and then making plans to build for others too. Goal by 2018; find land for a sustainable small community of these.